FRANK BRANGWYN Typed Letter Signed. Sir Frank William Brangwyn RA. Belgian born Anglo-Welsh painter, engraver, illustrator and designer. TLS. 1p. The Jointure, Ditchling, Sussex. 6th August, 1933. To "Dear Mrs Young". 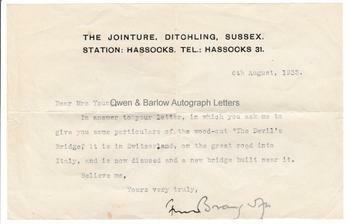 "In answer to your letter, in which you aske me to give you some particulars of the wood-cut "The Devil's Bridge". It is in Switzerland on the great road into Italy, and is now disused and a new bridge built near it. Believe me, Yours very truly, Frank Brangwyn." Oblong 8vo. 13 x 20 cms (5.25 x 8 inches). Very good. Frank Brangwyn had been a hugely prolific painter and illustrator and, during the course of his life, had also produced around a thousand etchings and wood-cuts, of which his wood-cut of 'The Devil's Bridge, St Gotthard's Pass" (c.1922) was one. However, by the date of this letter (1933) he had become increasingly disillusioned and reclusive and had begun to give away much of his earlier work. In 1936 he gifted many of his wood-cuts (including 'The Devil's Bridge') to the William Morris Gallery.